After months of deleopment and a low-key “soft-launch”, I’m pleased to announce my first premium WordPress plugin, USP Pro, the supercharged version of my free WP plugin, User Submitted Posts. 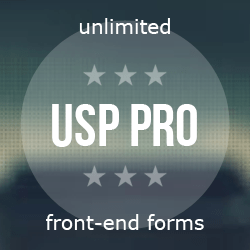 USP Pro enables you to create and customize infinitely many front-end forms and display them anywhere on your WordPress-powered site. Create unlimited forms for post submissions, user registration, contact forms, forum topics, art-directed content, and more from the front-end of your site. USP Pro ships with numerous form demos, shortcodes, quicktags, and custom fields to help you create and customize as many forms as required quickly and easily. Display submitted content anywhere in your theme using an extensive set of shortcodes and template tags. Auto-display uploaded images and/or use them as featured images. Let users customize their post content using WP’s built-in visual/rich-text editor, and submit content as posts, pages, or custom post types (with post demos!). Create forms to display on the front-end for registering new users. Assign default roles, customize form input with user-profile fields, custom fields, and much more. Auto-send post-submission and user-registration alerts to admin, users, and carbon-copy to any email(s). Display user info with shortcodes, template tags, and advanced user settings. Enable visitors to submit any supported file-type from the front-end: images, video, audio, PDF, zip, .docx, and many others. All files added to the WP Media Library. Uploads Settings enable you to set the number of files, min/max file dimensions, min/max file size, allowed file types, and more. Features include lightbox support, featured images, and image-previews. From forms and posts to users and uploads, USP Pro includes settings for customizing and fine-tuning just about every aspect of the post-submission process. Settings give you extensive control of forms, custom fields, error messages, success messages, labels, placeholders, user roles, redirects, categories, tags, and everything in between. Use the Form Builder to create and customize submission forms, registration forms, contact forms, forum topics, image uploaders, art-directed content, combination forms, and much more. USP Pro makes it easy to create any number of custom forms using quicktags, shortcodes, template tags, widgets, custom markup, and extensive settings to dial it in exactly as needed. USP Pro includes all existing and nearly all requested features of the free version of the plugin, so it is literally packed with many awesome settings and features. Feature highlights include show/hide-content shortcodes, remember form input, reset form shortcode, clean HTML markup, inline docs, automatic plugin updates, and robust options for contact forms. USP Pro uses the WP API for nearly everything: post-submission, user registration, media uploads, custom fields, shortcodes, quicktags, widgets, auto-updates, and much more. Extensive use of WordPress API helps to keep the plugin lightweight, flexible, fast, and secure. Screenshots here show more features of USP: tag inputs, form captcha, and clean code. The plugin is relatively new, but it’s equipped with auto-updates from the WP backend, which makes it easy to roll out new features, bugfixes, and other enhancements, as has already been done with USP Pro version 1.2. 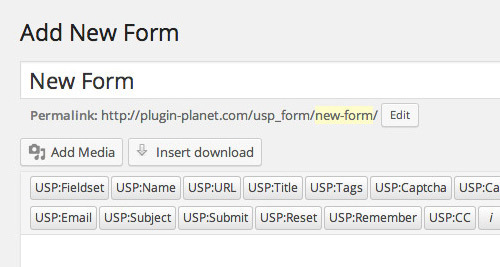 Please visit Plugin Planet to get help and leave feedback for USP Pro. Thanks!